Sign in to the AWS Management Console on your computer and open the AWS IoT Core console. If this is your first time opening this console, choose Get started. If you don't see the Greengrass node in the navigation pane, change to an AWS Region that supports AWS IoT Greengrass. For the list of supported regions, see AWS Regions and Endpoints in the AWS General Reference. 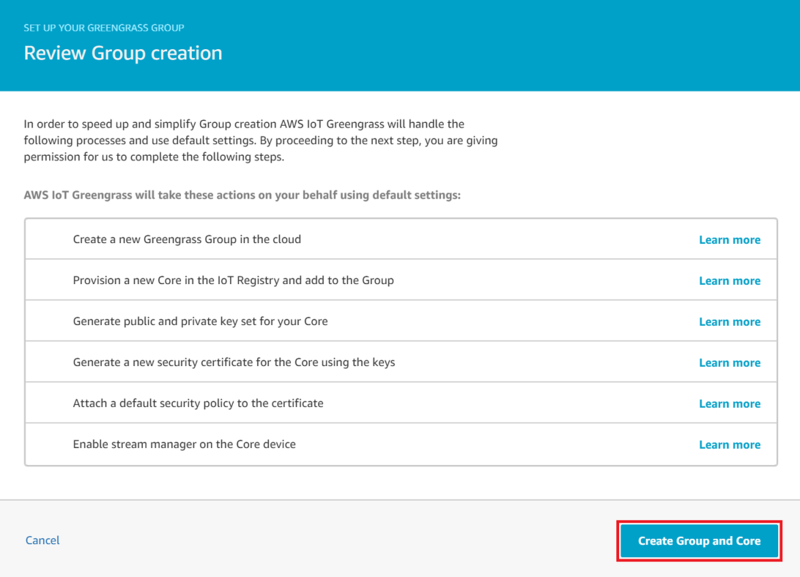 On the Welcome to AWS IoT Greengrass page, choose Create a Group. 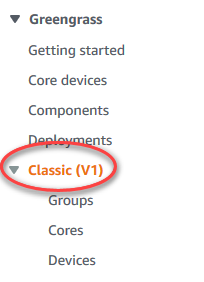 An AWS IoT Greengrass group contains settings and other information about its components, such as devices, Lambda functions, and connectors. A group defines how its components can interact with each other. For an example that uses the AWS IoT Greengrass API to create and deploy a group, see the gg_group_setup package from GitHub. On the Set up your Greengrass group page, choose Use easy creation. 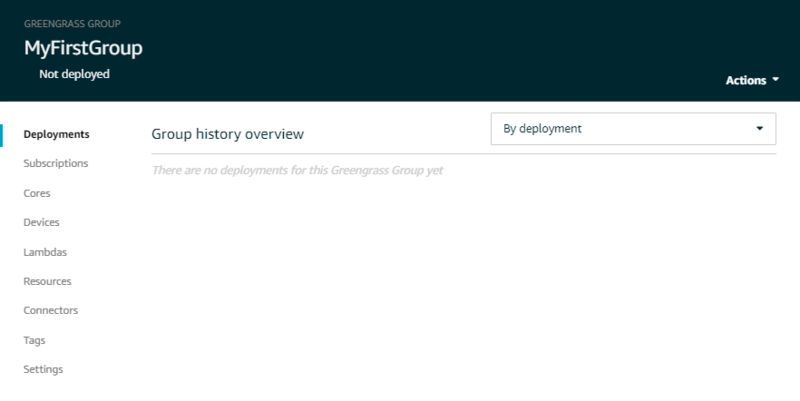 Each group requires an AWS IoT Greengrass core, which manages local processes. A core needs a certificate that allows it to access AWS IoT and an AWS IoT policy that allows it to perform AWS IoT and AWS IoT Greengrass actions. This step creates and provisions a core for the new group. Enter a name for your group (for example, MyFirstGroup), and then choose Next. 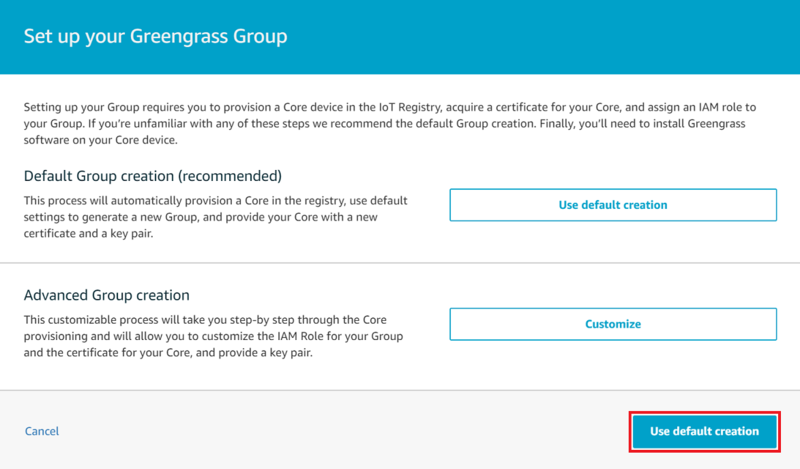 Use the default name for the AWS IoT Greengrass core, and then choose Next. On the Run a scripted easy Group creation page, choose Create Group and Core. AWS IoT creates an AWS IoT Greengrass group with default security policies and configuration files for you to load onto your device. On the confirmation page, under Download and store your Core's security resources, choose Download these resources as a tar.gz to download the required security resources for your AWS IoT Greengrass core. For Raspberry Pi, download the ARMv7l for Raspbian package. For an Amazon EC2 instance, download the x86_64 for Linux package. For NVIDIA Jetson TX2, download the ARMv8 (AArch64) for Ubuntu package. For Intel Atom, download the x86_64 for Linux package. Download both the security resources and core software before you choose Finish. After you have downloaded the security resources and the AWS IoT Greengrass Core software, choose Finish.